As usual I simply leave it to your own eyes to make the call. The chassis is sidewinder and utilizes the EVO 6 chassis. For newcomers, please click here to learn more about the chassis. Although different from what is shown there, this is the 6 screw configuration and it works just fine. It’s worth mentioning the classic series. These models all have sidewinder configurations and when tuned can be very close competition. 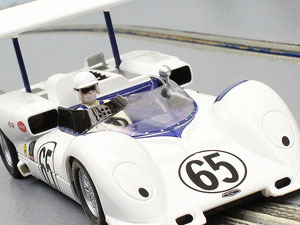 With the high wing (COG) the Chaparral struggles to stay in the hunt though. Now on smaller track like ours, the action is very close. I usually match it with the McLaren and we have had many great races over the years. This model just works. Right from the box to the track as a ready to run car should. In our road test the only thing I changed were the rear tires as the stock tires just do not work that well on our surface. I do not feel it is fair to show the car not performing well simply due to my own track surface. Most all enthusiasts change tires to match the track, so that is what you will see. Like I said, it just goes. When you take into account I have not added any weight or fine tuning of the front axle height or pod, that run is pretty impressive. At least to my eyes. I used Quick Slicks silicones in that road test. Many advanced racers like silicone so I decided to use them instead of my normal Paul Gage urethanes. After the test I installed the Paul Gage I normally use. This model is as timeless as it’s 1:1 counterpart in my eyes. It also shares another trait as not many were made, but the ones that were are truly worth a closer look. Having one more Chaparral to choose from is just good news and I am sure most of you will feel the same. This review proudly brought to you by SCALEXTRIC / Hornby America!